Chocolate Dollars | Molina & Sons (PHILS.) Inc.
Pusan Chocolate Dollar is made of rich chocolate and milk. 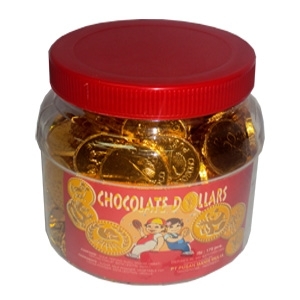 This delicious milk chocolate flavoured coins were stamped and wrapped with golden foil. This is truly a great treat for every child and child at heart.